These trendy gold earrings feature a vibrant green gem that makes a bold fashion statement, as well as positioning them as an all-season accessory to your wardrobe. The 3.40 Carat Emerald-Cut Peridot Stud Earrings sit nicely on the ear and have no trouble attracting the light. Their luminescence has a wonderful way of brightening up the face thanks to their translucent nature and interesting shape. The shimmering lime tones of the peridot gem (8mm by 6mm) convey a slightly retro feel, yet its clean simple lines speak to an intentionally modern design. 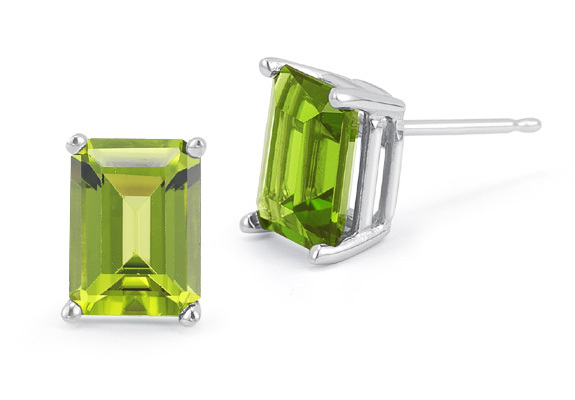 The rectangular cut draws out a depth to the earrings like ascending steps of a staircase, allowing light to proliferate throughout the peridots. The gemstones sit in a 14k white gold setting with four polished arms holding each stone in place. The back of the earrings feature a traditional solid gold post with a push back, making them a cinch to put on.